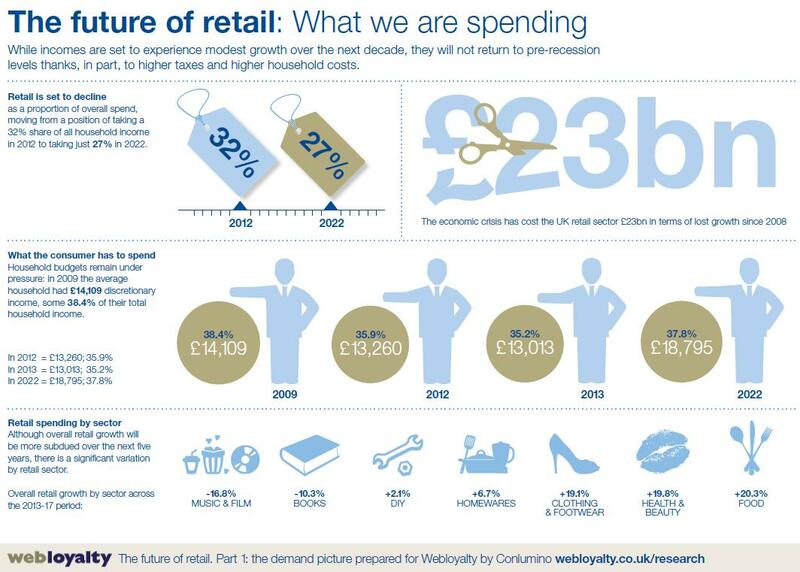 New research, commissioned from Conlumino by eCommerce partner Webloyalty, into the future of retail reveals the full impact of the recession to UK retailers, showing that the economic crisis has cost the retail sector a staggering £23bn in terms of lost growth since 2008. The study also shows that UK consumers are increasingly using mobile and social media channels to interact with retailers, which in part will result in an estimated 31% of high street stores closing by 2020. The research reveals that retail is set to lose out further over the next decade as the proportion of discretionary income spent on the sector is expected to decline. Although overall household income will start to rise as the downturn eases, the proportion of disposable income will not recover to pre-recession levels. Moreover, retail’s share of discretionary income, which today stands at 32%, will decline to 27% by 2022. The pressure on some areas is more pronounced. Music, film and book retailers will continue to struggle with spend expected to fall further with the move to digital media and subscription services. However spending on health and beauty, and clothing and footwear is expected to rise by nearly 20%, as they are more needs-based, and because the products are a way for consumers to treat themselves at relatively low expense. Webloyalty’s research reveals that the growing influence of online channels is affecting the way we shop, with 85% of UK consumers aged 18 and over now regularly shopping on the internet. This change is affecting town centres, where 31% of high street stores are expected to close by 2020. With the growing popularity of online and mobile shopping, social media is also increasingly being used for price comparison, browsing and purchasing. 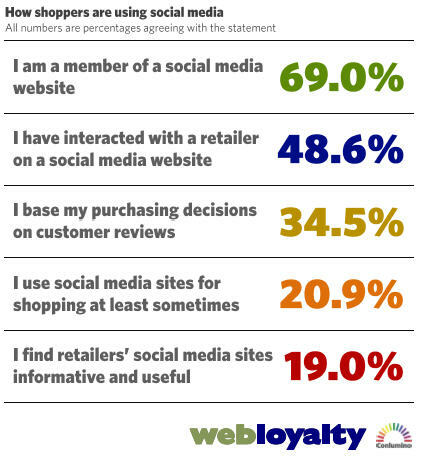 We are seeing the rise of the “social shopper” with 69% of consumers now members of social media websites and half of these interacting with retailers through social media. This Webloyalty research suggests that by 2020, mobile shopping will play a part in one quarter of all purchases, through either price checking or direct purchases. Consumers will expect a more personal experience. The report predicts that retailers will tailor experiences more and more to customer needs, based on insight into their past behaviour. This entry was posted in Consumer Trends, News and tagged conlumino, Future of Retail, guy chiswick, neil saunders, webloyalty. Bookmark the permalink.